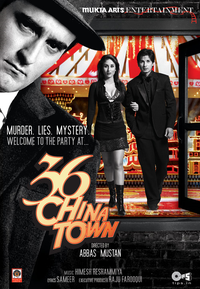 Review Summary: On the whole 36 CHINA TOWN is high on hype but low on substance. Disappointing! On the whole 36 CHINA TOWN is high on hype but low on substance. Disappointing! Subhash Ghai must be a busy man. Anyone suggests you watch this, you had best be apprehensive! On the whole, 36 CHINA TOWN is high on hype, but low on substance. Disappointing! 36 China Town is nothing but a medley of soundn-buffoonery, signifying nothing. Yet, it has its 'moments' and as you get out of the movie theatre you wouldn't feel cheated. Abbas-Mastan deliver another hit for if the audience reaction is to go by, then the public isn't much bothered about the lack of mystery in Casino Queen Sonia Chang's murder. The nach baliye pair of Shahid-Kareena, stylish cop Akshaey Khanna and super oomph Upen Patel keep things rolling for good. I bet you've heard by now that 36 China Town is an awful film.